SingTrue can teach anybody to sing in perfect tune. Even if you think you’re tone deaf! Worried that you have a bad voice? Always told you’re out of tune or off-key when you sing? Many people think they can’t sing because they don’t have “natural talent” or weren’t born “musically gifted”. The surprising truth is that anybody can learn to sing well, even those who feel totally unmusical. 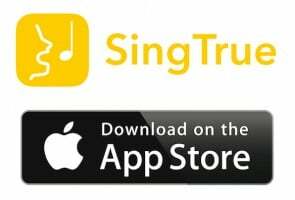 SingTrue features over 30 interactive exercises that help you learn to sing easily, confidently and in perfect tune. By using the iPhone microphone and sophisticated signal processing, the app analyses your singing and provides personal feedback on how you can improve. Spend a few minutes practicing with the app’s exercises every day and you will rapidly become a capable, confident singer. The exercises have been designed by experts, in consultation with some of the leading vocal teachers in the world. 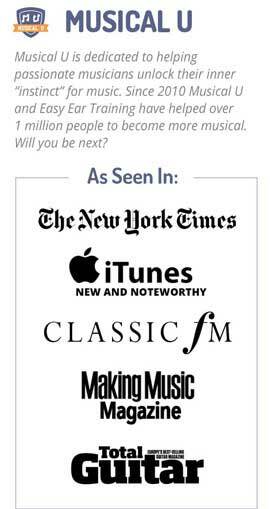 Building on the success of the RelativePitch ear training app (featured by Apple and used by over 200,000 musicians) and the Tone Deaf Test (4.5-star rated app used by 80,000+ people), SingTrue has been developed to help more people discover their inner voice and naturally become sensational musicians. Q: What if I’m tone deaf? A: Don’t worry! You probably aren’t. Over 40,000 people have taken our Tone Deaf Test, and just 2% have proved to be genuinely tone deaf. Still worried? Search the App Store for our free “Tone Deaf Test” app. A: Yes, it’s simply a matter of learning pitch sensitivity (ears) and vocal control (voice). Learn more and see the app in action! SingTrue has really helped me improve my projection and ear. Everyone in my singing group is using this app. I highly recommend it! I’ve tried a number of singing apps and I have to say this is one of the best. I’m still in the early stages (I need a lot of help) but I like how it’s going and how it progresses from easier to harder. Such a great app! It has really helped me to boost my confidence and my singing ability. I would definitely recommend it to anyone who maybe wanted to develop their voice on their own terms or in private. I’m a singer and have always wanted formal lessons but as a student and part time worker have found it difficult. But this app has made it possible. I’ve been hooked since downloading a week ago and after going through all the free modules purchased the entire set of lessons. I like that it’s not a moderate level of difficulty but really pushes you and trains your ear. I definitely recommend. Have really seen an improvement in my singing and playing! I have never believed that I could sing. I have always been afraid to sing where anyone could hear me. The computer doesn’t seem to mind all the mistakes that I make. I am amazed at the progress I am making and this app allows me to see that progress. I practice every day because it is fun! I’m not a good singer by any means but with this app I think I finally have a chance to learn. It’s been a few hours now I’ve spent on it and I already can notice an improvement. Can’t wait to see where I’ll get when I’ll have completed all levels. fun and useful!”,This app is great way to learn to sing and to prove to my husband that I’m not tone deaf! I can’t stop using it – not sure if the neighbours are enjoying it as much as me ;-) It’s a beautiful app with a clean and easy to use interface. Thanks! Everyone who knows me says I can’t sing and I’d given up hoping it could be otherwise. Even in a short time with this app I can hear my improvement and I can’t wait to prove people wrong. I ❤️ this app because it really helps you sing better and it has great vocal excersises for your [voive] voice to get bettter. It does exactly what its says its helped find better singing technique naturally and i can find my tone in which i sing and its helped me with notes. The BEST singing app yet! :D Thank you! And it’s all free!???? I just got this app today and already can feel and hear an improvement in my pitch. This a great app that any singer would want to help with pitch control and voice. A great way to build confidence in singing! I am enjoying each lesson. It is like playing a game and you are your own competition! A nice way to improve pitch and tone! J’ai commencé il y a une semaine. A ce stade permet de travailler mon oreille avec des exercices progressifs et courts. I’m an aficionado soloist and really enjoy this app. Very engaging and helpful. Easy to use! Love it so far! I love this app so much it has helped me tremendously! This is a real review from a REAL person. Some on here may not be but this one is. Has a good training program. It gives you the pitch you sing most comfortable in! I like it and recommended for my beginner praise team singers. This app is so much fun I love it and feel like I’m learning from it as well. I am just getting started with this app but so far it is proving to be helpful. fantastica!!! La consiglio a tutti!! I’ve just been talked into joining a choir and feel I need to know more about my voice. So far this app is giving me feedback that I can use so it is meeting my needs. I will continue to use it. This app has taught me a lot. Let’s me hear how my voice sounds. Nice app for singing! Cannot wait for more updates! I have tried many music apps over the last few years. This is one of the best. Good to thin out the voice.. I tried a number of learn to sing apps and most of them were either way too hard or simply boring. I love that this app starts at my level and goes at my pace. easy & helpful”,This is a great app for all the shy singers who are convinced they can’t hit a note. Easy to use and helpful exercises. Love it! Keep adding to it! This app is easy to use & seems to be helping my vocal control. It’s great and I enjoy using it . I find the app entertaining and helpfull. Muy buena y divertida :) me encanta. I enjoy using this app; I just have to keep using it in order to improve my thinking. Like the feedback I get. Helps me find and hold tones. Tracks progress. Good thus far. It’s an amazing app. Helped me a lot. Awesome app! Strongly recommended to anyone interested in developing their voice and musician ears. In future versions I’d really like to see interval ear training with ability to input intervals by voice. Lots of fun and very easy to get started with. Give it a try – you might be surprised at how good you are! I play multiple musical instruments and recently joined a mariachi. I don’t plan to become a solo singer but I would like to match pitch with everyone else. I really hope this app trains me to be able to sing and tune by ear. So far it’s great. Fun & will help you sing! Really great app. Love that you can see exactly how you improve as you go through the levels. Definitely recommend this to anyone who worries at karaoke time! Great app for training yourself to sing. 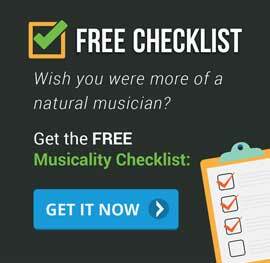 I really enjoyed taking the quiz and training myself in how to improve my singing. I’m just hoping it pays off when I go to karaoke! I may be addicted already! This is really cool – easy to follow and you can see progress quickly. I love being able to develop a new skill from an app! I love the fact that you get immediate feedback from this app. Singing and listening – I keep wanting to improve my score- it’s great how quickly the practice shows! Another amazing app from the makers of Relative Pitch. They make the most effective and user-friendly apps for training your ear. Thrilled to now have something similar to train my voice. My favorite one so far! Click here to download SingTrue from the App Store.